4HR, AREA History Tours and Central Coast Ferries, supported by Central Coast Council, present Special History & Heritage Ferry Tours to many of the sites featured on this website. Over the past few years all our tours have been booked for week-days, so to provide an opportunity for week-day workers and students to share our heritage and history, two tours are scheduled for weekends during the Festival in May. We are also doing some weekdays. Operating for almost four years now, the popularity of these tours continues to grow. ​To improve the experience, the ferry sound-system has been upgraded and new A/V monitors to the aft deck should be installed by May. ALL adult fares for this special event are at CONCESSION price! Child $20. HISTORY & HERITAGE, HUNTER TO HAWKESBURY researches regional, national and international history with the aim of bringing this information to the public. This is done via exhibitions, displays and personal presentations. It all started about 5 years ago when I began researching the history of the Broken Bay/Gosford/Hawkesbury/Lake Macquarie areas. Hearing of my work and the graphics I was producing, various community organisations asked me to do presentations and due to the popularity of these, this website was established. Since then the research and the production of presentation material has continued with a number of awards and mentions in Parliament being received along the way. By 2015 I had developed the idea of presenting an Audio Visual history on a ferry while actually being at the places I was speaking about. With the support of a Gosford City Council grant and the aim of conducting two or three tours, the ferry 'Sorrento' was fitted with an A/V monitor. The popularity of the tours has been far beyond expectations and has seen these very unique tours continue on a regular basis. Come aboard and during the tour you will go to sites, otherwise extremely difficult, if not virtually impossible to access and which can only be fully appreciated from the water. I will explain the history, while on a large A/V screen will be displayed graphics, animations, historic and onsite photos, static and working models/dioramas. The General Gordon steam stern-wheeler, linked the Australian East Coast for three years. ​- an engineering wonder of its age, why did the first one​ fail? Here is an unique photo of the Tour de France 1940. Thanks to Ernie for the photograph. The Patricia Cam was built at George Beattie's ship yard 'Palermo' on the Brisbane Water, New South Wales Central Coast. It was launched in 1940, requisitioned by the Australian Navy in 1942 it was sent to Darwin. On 22 Jan 1943 it was attacked and sunk by an IJN Aichi E13A (Jake) sea plane. 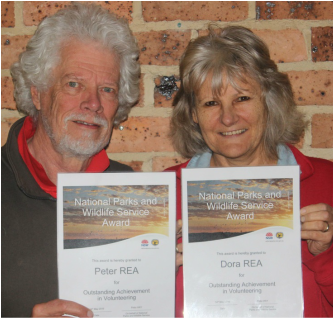 On Friday 17 June 2016, Peter was in Sydney undertaking further research for the General Gordon Project when Dora phoned him and said that they had just received a hand delivered envelope to their home which contained two individual National Parks & Wildlife Service Awards for ‘Outstanding Achievement’. Dora and Peter wish to point out that they receive a lot of support from a lot of people and they wish to thank all those who have provided and continue to provide so much support for their work. 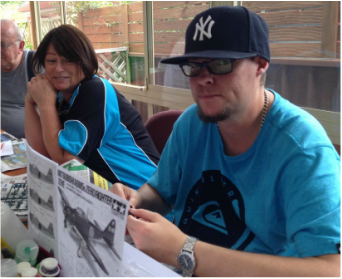 Following up on a proposal from Central Coast Care via Delphis Australia where a history modelling program was commenced, 4HR intiated a similar project with Central Coast Disabilities Network. Both have proven very successful and were used as pilot programs. 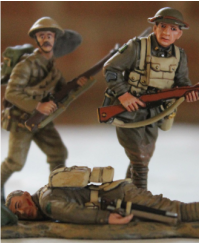 CCDN is now undertaking a major work about the WWII Greek & Crete campaigns, with one member aiming to undertake public speaking on the subject. ​Gosford City Councillor Vicki Scott presents a cheque to 4HR, which allow history ferry tours to commence in November 2015. 4HR successfully gained a grant from Gosford City Council, and auspices by Brisbane Water Historical Society to conduct History Ferry Tours on the Hawkesbury and Broken Bay aboard Central Coast Ferries 'Sorrento'. Despite his appearance in this picture, Peter was lost for words on the night. 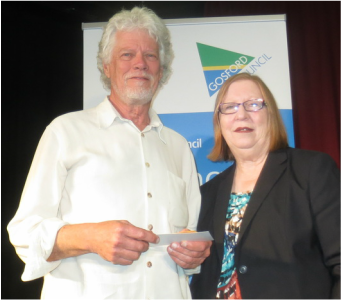 10 June 2015 the Gosford City Council Heritage Awards were announced. 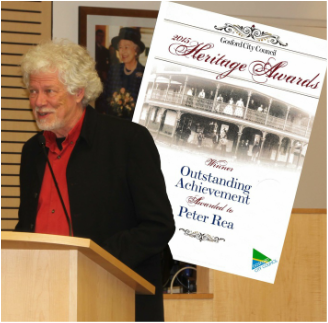 Peter Rea from 4HR was nominated for the ‘Historical Research & Publication’ section and the 'Outstanding Achievement Award'. The final presentation of the night was the 'Outstanding Achievement Award', which went to Peter. The award was in recognition of the research and the exhibition works so far produced by Peter and those works currently in production which will be unveiled progressively. Peter points out this award would not have been possible without the support and assistance of others as mentioned on this website (particularly his wife Dora). a model for the central coast marine discovery centre, TERRIGAL. 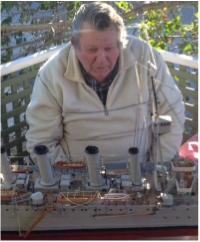 Peter Rea built this model of the HMAS Adelaide. 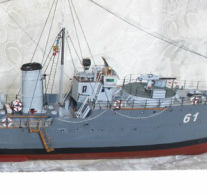 The model was built for display in the Central Coast Marine Discovery Centre, Terrigal. 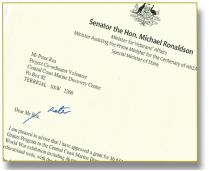 ​The ex-HMAS Adelaide was scuttled as a dive wreck at Terrigal/Avoca Beach in April 2011. 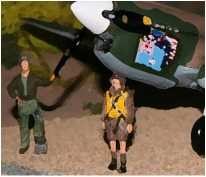 With the assistance of the office of NSW Heritage and the NSW-NPWS, 4HR will be taking the drawings done in conjunction with Jack 'Bluey' Mercer, the RAA - NSW Branch and W.H.A.T. to build a railway. Left: Our light horseman is checking a few of the parts that have been purchased, with all the work 4HR has on for Anzac 2015 we promised we would not start on the railway until May, well that didn't work! See more under the 'Inclined Railway' heading on our West Head Battery page. Mick Evans with the 2nd ship he built for 4HR. 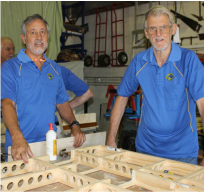 The 1.8 m long model is housed in a display case made by Bateau Bay Men's Shed with internal lighting by Peter Adderley. 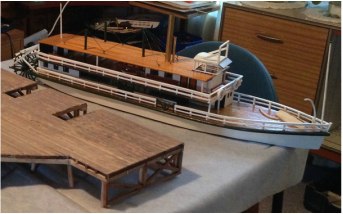 Also within the case is a 1:350 scale SMS Emden, a specially drawn 1:350 illustration of Sydney, other graphics produced by Peter Rea and historic photos relating to the 1914 Sydney/Emden engagement. The construction commenced in June 2014 with a Gosford City Council Community Grant for materials. At the same time a Federal Government grant was applied for, it took about 5 months just to gain grant approval. Appeals to Canberra and the Member for Robertson fell on deaf ears. With over a thousand hours work to be done the long promised funds finally arrived just 48 hours before ANZAC Day. Personal funds kept the projects moving slowly. Also during this time the $AU dropped dramatically effectually reducing the amount required...all very disappointing More…. 'If we don't know where we came from how can we know where we're going' said Member for Gosford Chris Holstein to around 60 people at Gosford's Henry Kendall Museum on 21 Feb. 2015. The Hon. 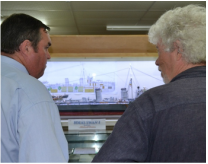 Member also took time to look at the historic models 4HR had on loan to the museum and talk to 4HR about their ongoing work which he highlighted in NSW Parliament last year. 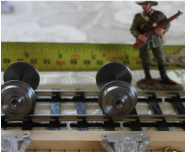 Funding to cover expenses for building an historic working model and diorama of a unique Australian inclined railway at the West Head Battery. 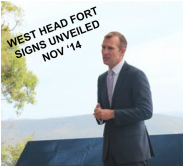 On 14 November 2014 Rob Stokes, Minister for Heritage & Environment unveiled signs at Commodore Heights presenting information about the West Head Battery. Much of the information on the signs is based on the original graphics by Peter Rea completed over the past 18 months. A few months ago the NSW National Parks and Wildlife Service gained the OK from 4HR to use the artwork on the signs. 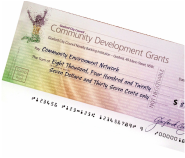 In June 2014, 4HR was successful in its application for a Community Development Grant from Gosford City Council. The funds will be used to meet the cost of materials and other out of pocket expenses for an exhibition regarding the Centenary of Anzac. Peter & Dora Rea as members of the the 'West Head Awareness Team' receive a 2014 Heritage Award from Heritage Council of NSW. 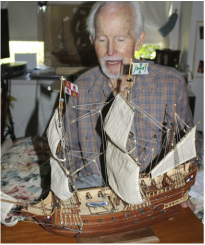 Last year we were happy to make the acquaintance of Rae Crosbie, former merchant seaman and current maker of some superb hand crafted wooden model ships, Rae was then building a Spanish Galleon. The HMAS Parramatta and HMAS Swan were two ships of the six Australian River Class Torpedo Boat Destroyers (TBD) that were built between 1909 and 1915. The Parramatta was the first ship ever built for the Australian Navy and the Swan was the first warship ever laid down in Australia. preparing for the exhibitions to be displayed in 2016/17, the 75th anniversary of incredible events that occurred in the first six months of the Pacific War. It took four great European Nations (plus the USA), four centuries to build empires that Japan destroyed four months. The Hawkesbury River Rail Bridge (opened 1889) and the Woy Woy Tunnel (opened 1887), were the last links in a railway system that linked Brisbane through Sydney and Melbourne to Adelaide. 600 labourers known as 'navvies' and their families were encamped at the southern end of the tunnel for 3 years during construction. ANZAC DAY POPPIES...'THE' most popular Anzac Centenary event. It's hard to believe this grass roots project failed to gain any of the $125,000 lavished on the seat of Robertson by the Abbot Federal Government. Gosford City Council came to the rescue and it proved to be a truly great success, one which we hope will be emulated in years to come. 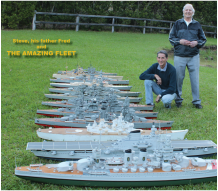 In April 2015 we had the pleasure of meeting Fred and his sons Steve, as a result we had the opportunity to photograph their fleet of mostly operational warship models. 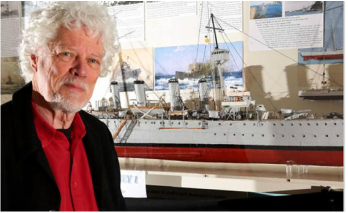 Steve has offered assistance with a model or two for 4HR's upcoming diorama of the WWII engagement of HMS Prince Of Wales and HMS Repulse with Japanese airpower in December 1941.